Forget the global sugar shortage of the past two years. 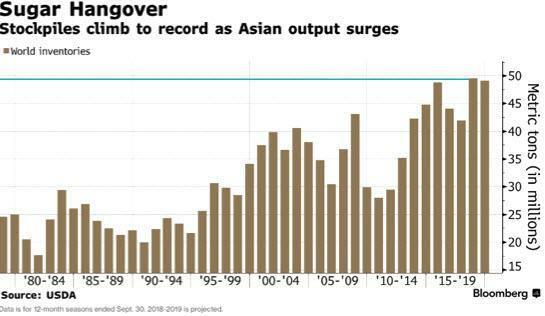 This season’s glut is forecast to send global stockpiles to record levels as slowing demand and surging production have left a sour taste in sugar bulls mouths. After reaching a high of 15.37 per pound on the third day of January, the price of sugar futures that trade on the Intercontinental Exchange has been on a linear path down, -25 percent to be exact. Sugar has been trapped in a multiyear bear market since El Nino forced a global shortage in 2016 when prices soared to 23.90. Since the high, the price has tumbled more than -65 percent to today’s level of 11.40. According to a report issued by The United Nations’ Food and Agriculture Organisation (FAO), world sugar production is projected to reach its highest ever level, even outpacing global demand, while trade wars are causing more short-term volatility for prices. FAO forecasters indicate that the excess supply is coming at a time when world sugar consumption is increasing, a long-term trend fueled by demand from emerging countries due to depressed prices. Although sugar prices have sustained a bear market for several years, rising international crude oil prices could help prices find support as the crop could be used to make ethanol for biofuels instead of an ingredient for food. “While it remains to be seen how trade measures implemented by the two countries will affect markets for oilseeds and oilseed products, China’s pending introduction of retaliatory tariffs on soybean imports from the US triggered a plunge in world soybean and soymeal prices, with strong spillovers effects across the oilcrops complex,” the report read. Historically, sugar is a highly volatile agricultural commodity due to weather trends: “Unless there’s a weather issue, it doesn’t look that the bulls have any hope for a sustained rally,” said Donald Selkin, a New York-based chief market strategist at Newbridge Securities Corp told Bloomberg. 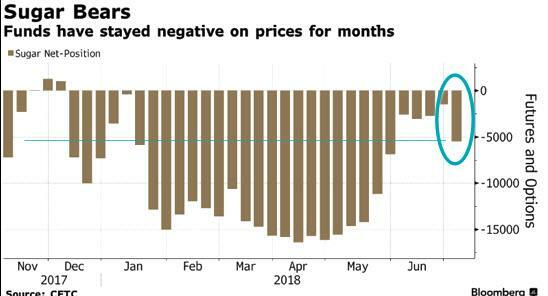 Bloomberg notes that the latest U.S. Commodity Futures Trading Commission data shows money managers more than tripled their net-short position. In other words, smart money is hedging for the next round of declines. However, all might not be lost for sugar bulls if an El Nino forms. Dry conditions could hurt sugar crops in Brazil’s Center-South, the world’s biggest producing region. The potential for an EL Nino weather pattern later this year could also mean some damage to Asian crops: “As a weak El Nino attempts to develop over the next 3-6 months, we must monitor precipitation patterns across major Asian sugar production regions including India, China, Thailand, and Indonesia. Typically once an El Nino is established, this leads to below normal rainfall across most of southern and eastern Asia. If this were to occur, growing conditions would be less favorable than what we are seeing now across this region,” said Ed Vallee, a meteorologist who works with institutional traders. Vallee is currently monitoring Typhoon Maria’s track barreling towards sugar producing regions in China.